Apparently it’s been forever since I’ve posted a review. Good job, me. I guess that’s what happens when you combine (a) the rare and elusive social life beast and (b) two straight weeks of spreadsheet DOOM. Yes, that deserved capitals. Anyhoo . . . RATING: 4/5 [in the genre] or 7/10 [all stories I’ve ever read]. FOR: Sci-fi lovers. People looking for something like The Lord of the Flies crossed with 28 Days. People looking for a clever new disaster story that’s zombie-free. It was just another ordinary day at McKinley High—until a massive explosion devastated the school. When loner David Thorpe tried to help his English teacher to safety, the teacher convulsed and died right in front of him. And that was just the beginning. A year later, McKinley has descended into chaos. All the students are infected with a virus that makes them deadly to adults. The school is under military quarantine. The teachers are gone. Violent gangs have formed based on high school social cliques. Without a gang, you’re as good as dead. And David has no gang. It’s just him and his little brother, Will, against the whole school. 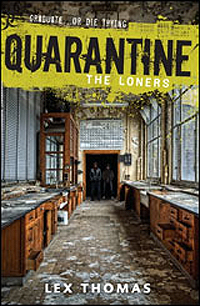 In this frighteningly dark and captivating novel, Lex Thomas locks readers inside a school where kids don’t fight to be popular, they fight to stay alive. I present to you, a delightful ARC I received from our friends at Egmont. I really liked it. Half of it, anyway. The first bit was alright, but I felt like I was reading two different stories. After a slow start, the plot raced forward at breakneck speed into a fascinating novel with a very novel look at dystopia. Let’s break it down. The first half was almost entirely set-up. It suffered a bit from a lack of the old “show, don’t tell” adage. We started fine with our introduction to David and Will. Then disaster hit immediately. Good sign. We get rolling in an instant. However, suddenly we jumped forward into a montage-style “Months passed and all these things were happening and this was how the school became.” Instead of living through the formation of the clique gangs, the barter system, the drops, the first breach of the military—all really vibrant elements of a well-conceived alternate world—we read about it as though in a newspaper article. After the fact. As a result, I found myself dragging through much of the first half. Not to mention, we’re in David’s head entirely until maybe a third of the way in. Then we begin to jump in and out of whoever’s head is most convenient. A little sloppy on the literary side, in my opinion. Stick to point-of-view changes from the start, or stick to one voice. Cut to Act Two. Suddenly, we’re not looking at the past anymore. David is in the midst of caring for Will and himself, with the threat of his enemy Sam always looming. He’s forming his own gang. He’s taking us on a tour through the workings of a system ruled by guerilla warfare, blackmail, and fear mongering, where athletes rule the school and a palm-sized shard of mirror could buy you a month’s worth of food. Captivating! Interesting! I was engrossed in the struggle between David and Sam, Will’s feelings of inadequacy, Lucy’s idiotic girlishness (yes, I hated her). I came to know the gang members and to root for them in their scrapes. David bothered me, but I think this added to the story. He was self-centered, he was big-headed, and we were supposed to watch him fall by these flaws. And overcome them. I quibble again only over the ending. I won’t spoil it. Suffice to say, the twist with David was fantastically evil on the part of Thomas. No unearned happy endings here! However, the ending with Will and Lucy left me blinking like a dumb doll. It was too abrupt and not in a jarring, horror-movie, must-read-next-book-NOW sort of way. I just felt cheated. Like I needed one more scene, or one less. I wish the first bit could have been ironed out prior to publication. Perhaps it will be. Overall, I’ll say that if you don’t mind the slow beginning, the last half of the book is well worth the read.